Is authenticity a value cultivated in creative industries today? Or are we surrounded by a hypocrisy of using art as an instrument to mask the diktat of commercial power, under the appearance of a cool billboard or an alluring advertisement? Advertising has made increasingly difficult to distinguish between genuine messages and subliminally packed lies, as we find ourselves less and less equipped to control what we assimilate from the daily tornados of images, logos, and taglines. What happens, though, when art, essentially a conduit for widening perspectives and opening minds, gets dragged in this vortex of consuming images, rather than exploring them for meaning? 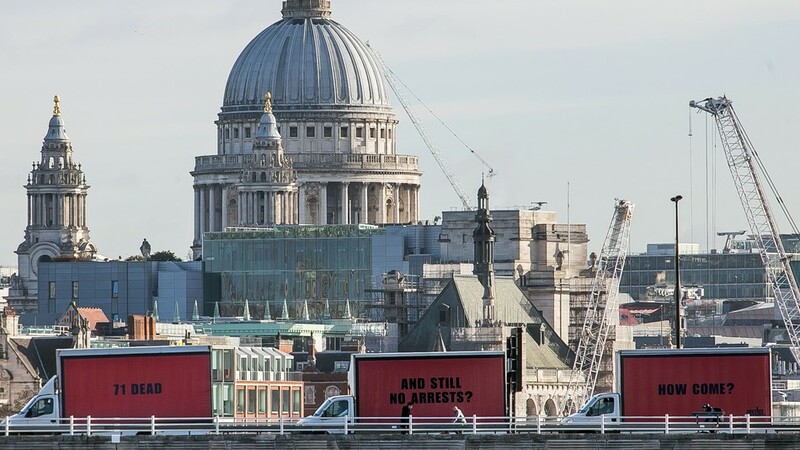 Inspired by the film 3 Billboards Outside Ebbing, Missouri, Justice4Grenfell campaign calls for change and justice with a moving billboard, carrying a message and questions around London city. If the art world finds itself often enough on a slippery slope when it comes to deriving value from monetary realities and popularity, some artists circumvent the rules of the establishment, and use art precisely against the capitalistic logic they evade. Looking at the works of Brandalism artists and reading their manifesto, it becomes apparent that they are already inhabiting a perpetual battleground. We cannot escape advertising, but we can engage with it, aware and critical: to win this "semiotic war" against corporate powers, against a "visual and psychological pollution," subversion is necessary. Brandalists mimic advertisements to reveal their fraudulence and reclaim truth on issues of environment, justice, gender, race, and social struggle. In 2012, Brandalism artists organised a project in which the billboards of five UK cities were covered with posters of a different nature, including a dripping blood NIKE monogram, the slogan "Just do it " transformed in a "Just loot it" warning with a warrior-like man holding a Footlocker and JD bag, parodies of the advertisements of the famous sports brands. Just Loot It billboard campaign in the UK, 2012. Subverting advertising is an international phenomenon, often a form of resistance emanating from counter-cultural environments. In Paris, during the 2015 UN conference on climate, on a bus stop appeared a fake advert of Volkswagen that claimed: "Drive cleaner or just pretend to. We lied about our emissions because we don't care about climate change. But we are not the only one." These interventions cause cognitive dissonance in the viewer, the sense of comfort of advertising is replaced by the feeling that something is deeply wrong and there is no correspondence between the image and the belief behind it. How do we know what is real anymore? How do we decide what message and channel is an ethical form of communication? In a reality challenged by “fake news,” how do we insert irony into the tapestry of public visual production, without risking its potential for genuine and constructive critique? 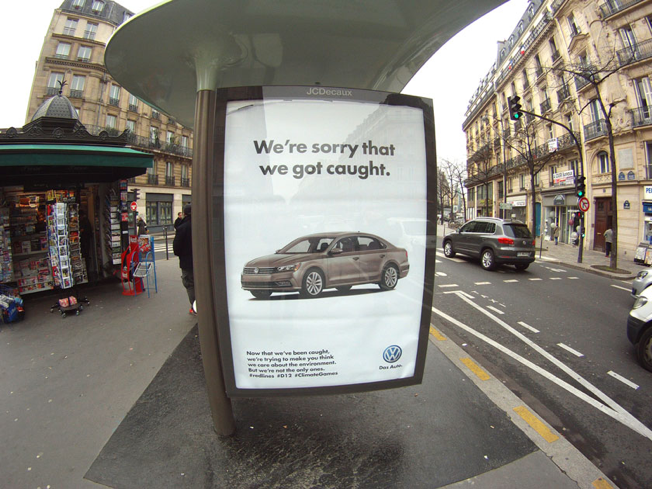 We're sorry that we got caught - fake Volkswagen billboard in Paris. Because we no longer buy products, but emotions and life-styles, more and more brands turn into self-proclaimed paladins of self-acceptance, of diversity, of women´s rights; sensitive to climate and social issue, advancing empty slogans such as "Because you´re worth it," and starting campaigns for the "natural woman." This type of discourse pollutes understanding and self-discovery, blocks reaction and response, and conditions our very movement in society. Brandalists want you to know all this; they want you to be aware that brands use you as much as you think you use them; they want you to have eyes open and know that “Advertising Shits in Your Head.” Above all, they want you to react.